The police car involved in an ultimately deadly pursuit with a parole violator did not have a working dash camera, Detroit Police Chief James Craig said, according to the Detroit Free Press. "The dash cam was not operational," Craig told reporters at a news conference Monday. "It was an older marked scout car that a special-operations unit was using." Last week, parole absconder Lorenzo Harris, driving a Chevy Camaro, led officers on a chase that led into a residential area, and the Camaro hit and killed two young siblings and injured three other children, authorities say. Harris is now facing multiple charges, including second-degree murder, as a result of the crash, the news site notes. Three special-operations officers were riding together, with officers reporting that they pursued the car because they saw someone inside the vehicle with a gun. However, no gun was recovered at the scene. A supervisor, according to the police chief, had tried to call off the pursuit at least three times to no avail. The Detroit Police Department is currently conducting an investigation to determine if department policy was violated in the pursuit. According to the Free Press, the policy notes that "officers shall utilize in-car video equipment for all vehicular pursuits," and that "officers must place the protection of human life over all other considerations." "Members involved in a pursuit must question whether the seriousness of the violation warrants continuation of the pursuit," the policy reads, the news site notes. "A pursuit shall be discontinued when, in the judgment of the primary unit, there is a clear and present danger to the public, which outweighs the need for immediate apprehension of the violator." The chase lasted just over a minute; however, the results were tragic. 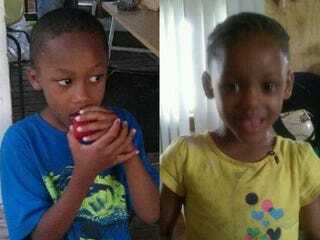 Siblings 6-year-old Michaelangelo Jackson and 3-year-old Makiah Jackson lost their lives in the crash. The children had reportedly been "riding their little scooters up and down the sidewalk," playing with other children when the Camaro ran into them, their grandmother Nicole Jackson told the Free Press in another report. "I can't believe it," Jackson, 40, told the news site. "I'm still trying to realize that they're not going to be here. They're gone. It's unreal." Three other children—Zyaire Gardner, 7; Isaiah Williams, 5; and Darius Andrews Jr., 3—were in critical condition following the crash, however, Isaiah and Darius have since been released. A family member told the Free Press that Zyaire remains in the hospital. Harris reportedly has a long rap sheet, according to the Free Press. In May 2006 he was imprisoned on a drug charge and was denied parole for that year. In 2007 he was granted parole but fled his responsibilities in September before being picked up again in November. Harris eventually went back to prison and was denied parole three times in 2008, 2011 and 2012 before being paroled in 2013 to the Detroit Reentry Center for additional programming. In early 2014 he was released back into the public; however, by the next day he was listed as an absconder, the Free Press reports. Police began chasing him last week at around 7:30 in the evening, when he hit the siblings, officials say. However, Harris reportedly did not pause, continuing to drive along the sidewalk and across front yards, hitting the other three children, authorities say. "When he hit those kids on the first block, it should have got shut down," Darius Andrews Sr., the father of one of the victims, told the Free Press. "But guess what: He ran like a coward. And guess what: The police chased him and this happened. This is ridiculous." Jackson's fiance, Ron Antczak, also put partial blame on the police for their part in the tragedy. "Police should know better than to chase people down a residential street," he said. "Why would you do it on a residential street where there's kids?" Read more from the Detroit Free Press here and here.